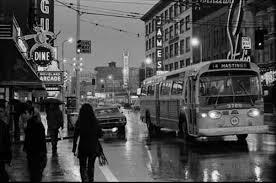 I remember one damp and dreary day in Vancouver that stands out from all the other damp and dreary days. It had been a particular damp, grey February. It had been overcast or raining for weeks and weeks and weeks. I was riding on the busy to work. It was the same bus that I had been riding on for two years. Every weekday morning, I would commute by bus from the suburbs into the heart of the city. At six-fifteen, I would stand with the same people at the same bus stop and get on the same bus, that carried all the same people to their same jobs. On a good day, the trip would usually take 45 minutes. Nobody ever spoke on that bus. Occasionally people would nod or smile at the all too familiar faces of their daily travelling companions, but conversation would be reserved for sunny days, when people could only manage a word or two. It was like there was this unwritten rule that nobody had the energy or the inclination to break. We saw one another almost every day, and yet, we knew absolutely nothing about one another and that was the way we were determined to keep it. On this particular dull, depressing, February morning, in addition to being tired, I was also wet. The wind was really blowing so I carried my umbrella in vain. Unable to open my umbrella, I had to rely on my hooded jacket to keep me dry. The bus was running late and the water was just beginning to seep through my jacket. When I finally climbed aboard, the windows of the bus were totally steamed, obscuring the view of the darkened wet world. I was determined to ignore the damp and settled in for what I hoped would be a short nap before we reached the city. I was just managing to doze off when the bust screeched to a halt. Several passengers climbed aboard. All but one of the passengers were recognizable. I’d seen them a hundred times before. But the young man, who loudly greeted the bus driver with a “Hello”, him I’d never seen before. He struggled to fold his broken umbrella as he stumbled to the rear of the bus. He sat opposite me, and proceed to greet everyone around him. People weren’t sure how to take this. Some just nodded and then looked away. Others mumbled a greeting before fixing their gaze out the window. I smiled, nodded and then closed my eyes, determined to escape into sleep. The young man, continued to fuss with his umbrella. He explained in a loud voice that the umbrella was a gift from his sister and he hoped that it wasn’t ruined. He asked the gentleman seated beside him if he could help him to fold it. The somewhat flustered gentleman proceeded to fold the umbrella without a word. When the task was completed the young man, thanked the gentleman and asked him what his name was. He said he wanted to be able to tell his sister, who the nice man was, that had helped him with his umbrella. Without revealing his name, the gentleman assured the young man that it wasn’t necessary to thank him. The young man, proceeded to break all the rules, and said that his name was Michael and he told us all that he had never ridden on this bus before. He usually had to get a bus that went to the city in the afternoon and then he would get a ride home after dinner with his sister. But on this day, he would begin to work full days at his job. So, he had to catch the bus in the dark. He went on to tell us that the bus we were riding in was much nicer than the one he usually caught. He decided that this bus must be a new bus, and weren’t we lucky to get to ride on a new bus. Then Michael took off his hat, held it out in front of him so we could all see it, and declared that he was the luckiest person in the world because his mother had bought him this wonderful hat that kept his head dry. Michael went on to tell us all sorts of details about his life. At first people managed to listen, without responding. But as Michael went on describing his wonderful life, people found that in spite of themselves they were drawn into the conversation. As we approached the tunnel that normally causes traffic to back up in rush hour, it was clear that there must have been some sort of accident in the tunnel. It would be a long wait. There would be no escaping Michael’s enthusiasm. Before long we all knew that Michael worked in the mail room of a securities company. He assured us that this security company was a safe place to work, because they didn’t take care of the safety of people, but just took care of pieces of paper that were called stocks and bonds. Michael told us just how much he loved his job. Having a job was the best thing. Before he had the job, he didn’t have any money to help his parents. But now he had enough money to help his parents and lots left over. Michael told us that he was really lucky because he worked with really nice people who took good care of him and let him do all kinds of fun jobs. Michael began asking his fellow passengers if they too had jobs and one by one the people around him began to tell him, where they worked and what they did. Michael was full of enthusiasm for the various jobs that people held. He even managed to be excited when I told him that I worked in an accounting department and my job was to count things. Michael said he was very good at counting. He had learned how when he was just a little boy. He liked counting. He thought that it would be great fun to be able to count things all day long. He sometimes was allowed to count supplies in the supplies cupboard and he liked doing that. At some point on our journey, Michael began to speak about the weather. Michael loved the rain. He told us how important the rain was and how wonderful it was that we got so much rain. Our trees could grow taller and bigger than trees anywhere else and our flowers just loved all the rain and there was so much food in the stores because the rain helped the vegetables to grow. Michael’s joy began to infect us. People smiled at one another. People began to speak and to respond to Michael’s joy. Some of us even waved at him when he got off at his stop, telling us all to have a good day and that he would see us all tomorrow. On that day and on every other day that I rode the bus with Michael, I was reminded, whether I liked it or not, of the beauty and the wonder of life. Somehow Michael managed to pierce our dullness. Somehow Michael was able to make us forget that his behaviour was inappropriate; that he was intruding on us, that the timing was all wrong, that he was breaking all our rules. Michael burst into our lives and interrupted our routines, and in the middle of a dull, damp and dreary February funk, he reminded us of how truly blessed we really are. Michael’s daily reminders challenged us all to remember our many blessings. So, in the wee hours of this morning, listening to the wind howl and the rain fall, I remembered Michael and couldn’t help myself, I just had to smile as I thought about all the things I had planned to put into this morning’s sermon. I was planning to tell you about all the scientific studies about gratitude; about how being grateful actually makes us happier, more self-disciplined and better able to achieve our goals. I was planning to tell you about the studies that proved without a doubt that people who express gratitude are healthier or how gratitude frees us from emotional pain. Scientists insist that if we want to let go of emotional pain we ought to practice being grateful. If we want to feel more joy, science has proven that we need to choose gratitude. I had gathered lots of scientific evidence to encourage all of us to cultivate the art of being grateful and then I planned to enumerate all the various blessings that we wealthy Canadians enjoy. But when the sound of the howling wind subsided into a gentle breeze I got up out of bed and as the raindrops gently fell outside and realized that despite the early morning hour, I was actually smiling. I am not a morning person. So, the realization that I was smiling even before I’d had a sip of coffee, well that’s really remarkable. The smile wouldn’t leave me as I thought about the beauty of Michael’s gratitude and it dawned on me, pardon the pun, but it dawned on my just how contagious gratitude can be. So, on this Thanksgiving morning, I offer you the blessing of Michael’s story in the hope that you too might become infected by Michael’s gratitude for the wonders of this amazing gift of life that each of us are blessed to live. May we always remember just how blessed we are. May we always notice each blessing as it comes. May we always take the time to cultivate an attitude of gratitude. May our gratitude always infect others with joy. So, let the rain fall, or let the sun shine, and let us give thanks by expressing our gratitude to the ONE in whom we live and move and have our being. For each day is a gift, a gift we share with one another. So, let us share our gratitude and bring joy to the world. This entry was posted in PONDERING PASTOR, Progressive Theology, SERMONS, STORIES, Theology and tagged Lutheran Thanksgiving Sermon, progressive Thanksgiving, Thanksgiving Sermon by Rev. Dawn Hutchings. Bookmark the permalink. Such a beautiful story and experience you have had. Thank you for sharing this with us. I truly believe in the power of Gratitude and my life is a living example of it too.